Well, didn’t we just love absolutely everything about Pretty Face. Everything. Here’s an Author who completely knows her chosen subject, detail upon detail, in order to set the most real and in-depth atmosphere making us live and breathe all things theatre whilst reading. The West End came alive for us and we were swept away. We loved Act Like It by this Author and if possible we loved this one even more. So romantic, such fabulous British dry humour, such theatrical and vivid imagery. 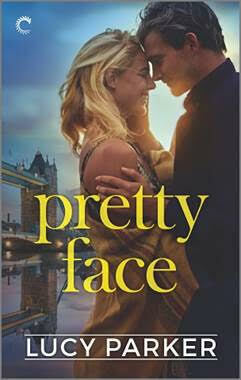 Pretty Face is book two in a series of standalones and we HIGHLY recommend both books. The way Lucy Parker writes captivates us word by word. Luc Savage, a theatre director, is stuck for a female lead in his upcoming theatre production. The stress levels are high as he’s a very obstinate, honest to a fault and a tad of an aloof man. Don’t let that deter you though because we’d bet you’ll fall in love with Luc just as much as we did. Luc has his rules and one of them is no shenanigans with his leading ladies. This man is lush; absolutely divine. He’s got a hard exterior and a sarcastic wit, yet when he opens his heart and shows vulnerability and his love, well you could’ve scooped us off of the floor with a spoon because we fell hard and melted. He doesn’t mince his words and had us chuckling so many times throughout. He had quite the battle on his hands when Lily Lamprey enters his audition room and his life. Lily is a bombshell with a pitchy breathy voice and a bubbly star in a TV soap opera. She’s the last person Luc would want in his show yet Lily is in dire need of a change in life and her desire is to tread the boards of the West End. We loved the dynamics between her and Luc, often having us in stitches of laughter. We fell in love with Lily who was as stereotyped as they come, her talent overlooked. Even Mr Savage committed a faux pas but he very soon realised the error of his ways. Scandals are a plenty in the world of theatre and its players, and we loved this humour filled slow burn romance. It had such high emotion and attention to detail. We fell in love with the characters and Lucy Parker once again mesmerized us with her prose. It’s not often you go through the colour wheel of emotion. so when we do, we treasure every minute of it.